In an effort to keep my goal of eating breakfast, I've had to make breakfasts that I'm actually interested in eating. Lately I've been making a fruit and yogurt parfait with homemade granola. In a mini trifle dish or small bowl, layer vanilla yogurt, granola, and a fresh fruit of your choice. Repeat the yogurt and granola layers and top with more fresh fruit. I like to use bananas, blueberries, and strawberries. The star of this parfait, though, is the homemade granola. Heat oven to 325 degrees. Line two baking sheets with parchment paper and set aside. Whisk together oats, almonds, walnuts, coconut, cinnamon and salt. Set aside. In medium saucepan over medium heat, melt together butter, oil, honey, and brown sugar until the sugar is dissolved and the mixture begins to boil. Carefully whisk together so it's well incorporated. Remove from heat and add the vanilla extract. Pour the warm mixture over the oat mixture and toss together with a wooden spoon. Make sure all of the oat mixture gets moistened by the sugar mixture. Spread mixture onto prepared baking sheets and place on the top two racks of the oven. Bake at 325 degrees for 25-30 minutes, removing from oven and tossing oats on pan twice during baking. To ensure even baking and prevent any burning, rotate the pans halfway through baking. After removing from oven, let the granola cool on pans before storing in an airtight container. Keeps for two weeks. *Make sure you use old fashioned oats. Using quick oats will make your granola sandy instead of crunchy. Plus old fashioned or steel-cut oats are healthier! 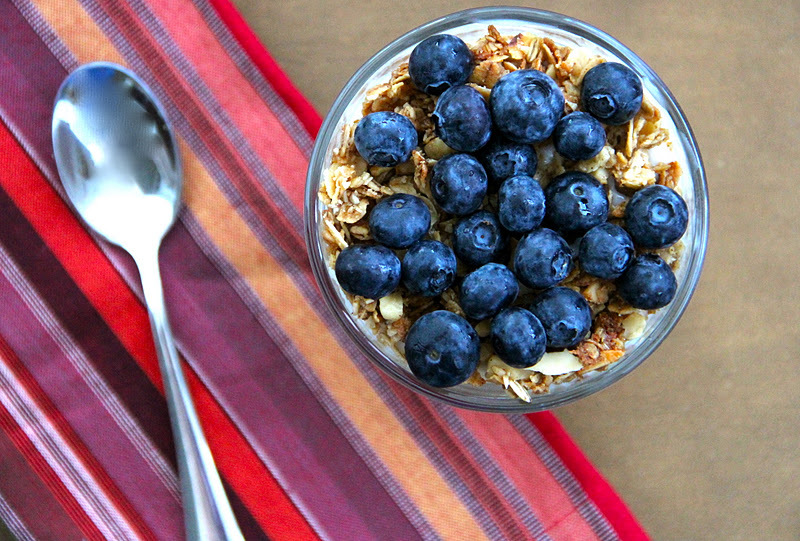 i love, love, parfaits, and i have all the ingredients for this granola! hmmm...i see myself picking up yogurt and some bluberries next week to make this all happen. thanks for sharing this recipe! Sherri, not only does this sound delicious, but your photographs are phenomenal!!! Looks so fresh and yummy. I think it makes all the difference when it's served in a pretty dish. First of all I have to compliment you one the beautiful pictures...love them! But I also have to say I love granola! I've never made my own but you make it sound easy enough. This looks delicious! I love homemade granola. And your photos are lovely! Ok this looks healthy and delicious! I think I could eat this right now! This looks delicious! I'm going to have to try this granola recipe; that's all we're eating these days for breakfast and I'm tired of my old one. Love those trifle dishes! Where did you get them? Oh that looks and sounds delicious. 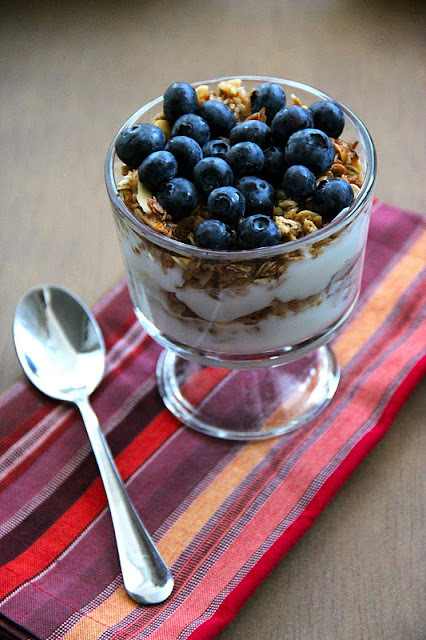 I am on a super low carb diet right now but I used to put some granola in my yogurt all the time!